Jayde Perkin’s I’m Not Ready – a short compilation of some of the artist’s autobio comic strips – begins with a prose introduction to the collection that talks briefly about one of the central themes of her work. It’s a childhood reminiscence about losing a Mr. Blobby balloon; one that evolves into an even more poignant metaphor about the black balloon she now carries with her – the visual articulation of grief seen on the comic’s cover. 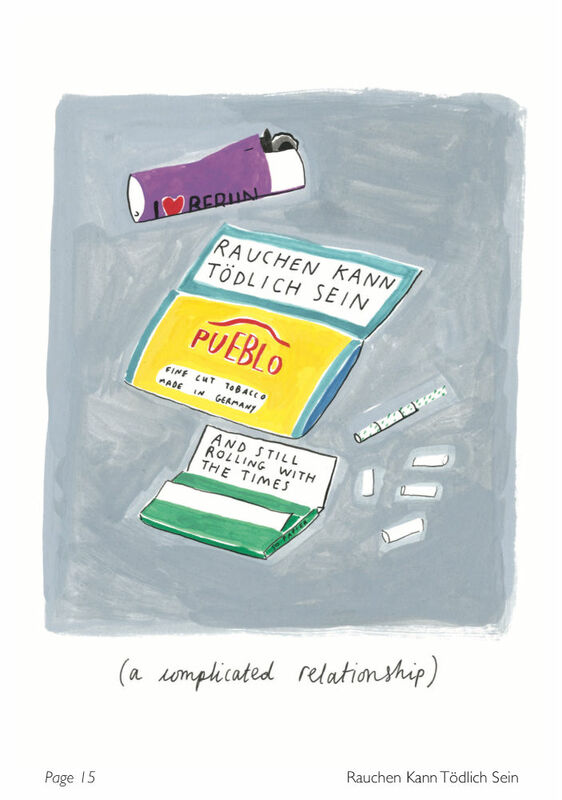 Simple, eloquent and lacking in ostentation it perfectly embodies Perkin’s approach to her practice and the raw but likeable honesty that was undoubtedly part of the reason she was selected as the winner of the ELCAF x WeTransfer Award at this year’s East London Comics and Arts Festival. 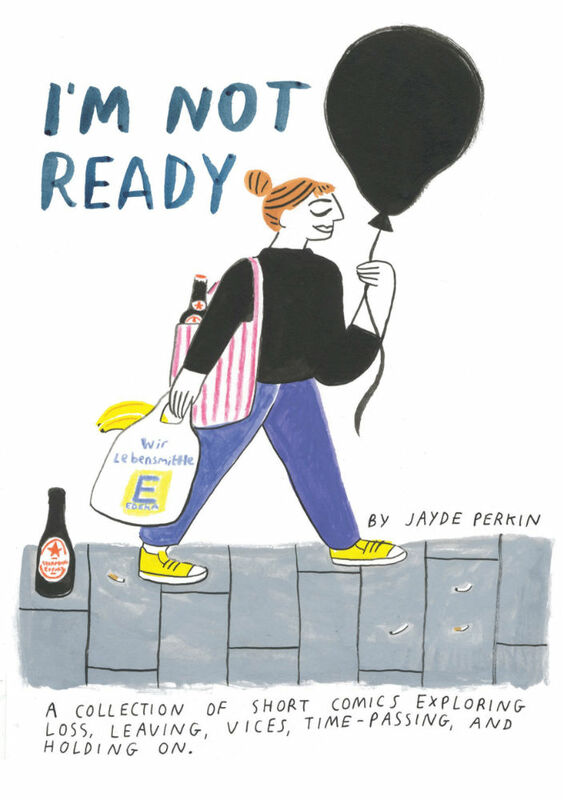 I’m Not Ready was the comic that won her that accolade at ELCAF this year and will be the springboard for an expanded version to debut at next year’s festival. The comic collects four shorter works created over the space of two years beginning with ‘Paving Paradise’ (below left). It plays with another familiar musical motif of Perkin’s work as she weaves the lyrics of Joni Mitchell into a short story that explores her grief from another perspective. Detailing a visit to her hometown after the death of her mother it underlines how loss can suddenly make us feel totally disconnected from what should be both the welcoming and the comfortable; how the familiar can be both recognisable and suddenly terribly alien, filled with the echoes of a past that suddenly seems remote and detached. Perkin’s art has an angular fluidity and a profoundly expressive quality that emerges from its deliberately disproportionate qualities and she is unafraid to switch back and forth from longer candid textual passages to sequences where she lets visual metaphor do all the talking. This is something she repeats to great effect in the second entry ‘Fitter, Healthier’ (below right), a look at how the media and marketing concerns manipulate our conceptions of body image, and the social constructs that we allow to govern us. In ‘Wish You Were Here’ (below left) Perkin underlines how sudden reminders of happier times can evoke memories that allow grief to overwhelm us. 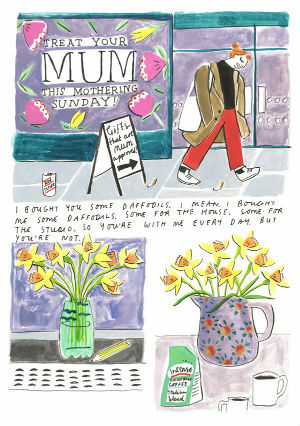 Mother’s Day is the catalyst here for a pensive exploration of how the tiniest triggers can reignite those feelings. 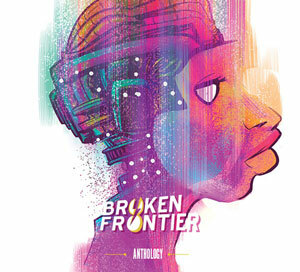 It’s heartbreaking, it’s pragmatic, it’s fragile and it’s beautifully constructed. In many ways it epitomises everything that makes Perkin’s comics such an immersive and connective read. She’s not looking to explain or define the objective qualities of grief; she’s simply allowing us to live her experiences for a few short pages and her comics have a powerful fluency for that. The final tale here is ‘Rauchen Kann Todlich Sein’ and examines her complicated relationship with tobacco which, as she mentions here, is what led to her mother’s passing. It explores dependency and the reasons for it, self-deception, and how we can paradoxically both accept and be in denial about something. And again it’s indicative of the way that Perkin bares her soul on the page with an honesty that is never less than admirable and always totally engaging in its openness. Grief is a subject that needs that approach, one that should be discussed not hidden away, and Perkin’s work will no doubt resonate with many who have gone through similar experiences. When it comes to our annual ‘Six to Watch’ initiatives I am often asked what I am looking for in potential artists. The easy answer is, of course, is that there is no single reason but in Jayde Perkin’s work you have perhaps the best immediate definition. 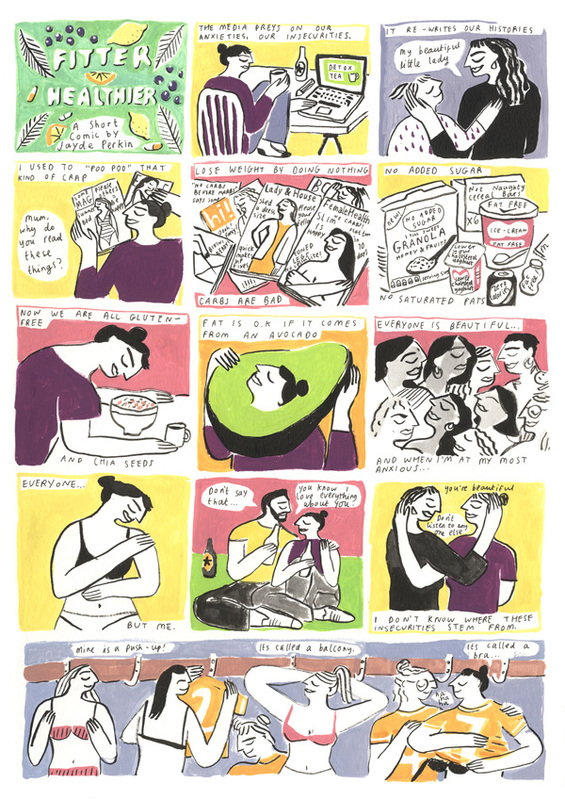 Here we have an artist whose understanding of how to use pure comics to communicate with her readership is both intuitive and instinctive and who forms the most powerful relationship with her audience. Pick this up at BCZF as a taster for next year’s ELCAF and be able to say that you were there near the beginning of this major new talent’s comics journey. For more on Jayde’s work visit her site here and her online store here. You can follow her on Twitter here. 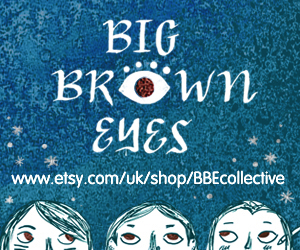 She will be exhibiting at this year’s Bristol Comic and Zine Fair on October 6th.